Now that the candy-comas of Halloween are behind us, let’s look ahead to the real reason to get excited for the Holidays…….FOOD! In case you are as surprised at how fast November is flying as we are, Thanksgiving is THIS THURSDAY! While everyone is gearing up with their elastic waistbands and carving knives for what will hopefully be a wonderful day of fun, food, family, and football, we are excited to share some of our favorite Thanksgiving Day Recipes to spice up your menu this year! Don’t forget – maternity pants make excellent “maturkey” pants – break those suckers out and enjoy. Let’s start with the basics. Nothing will up-level your turkey easier than doing a little brine-action. Here are two of our all-time favorites. Bon Appetit’s simple and stunning dry salt brine for the modern chef, and a classic wet brine recipe from Alton Brown for the traditionalist. This recipe IS the picture-perfect roast turkey you’ve been looking for (your whole life). It cooks to a perfect crisp brown on the outside and remains juicy and flavorful on the inside. The best part is you don’t have to run out for any special ingredients. You can cook this with literally just the salt and sugar brine come up a winner. The glaze adds a delicious complexity of flavors as well. We also stuff the cavity with lemon and a bundle of whatever fresh herbs we have on hand. Mix salt and brown sugar together in a medium bowl using your fingers until incorporated. Place turkey on a wire rack inside a rimmed baking sheet. Sprinkle dry brine all over outside and inside of the turkey, and nudging some into crevices. You won’t need all of the dry brine, but it’s good to have extra since some of it will end up on the baking sheet as you season the turkey. Chill turkey, uncovered, at least 12 hours and up to 2 days. We load a large cooler with LOTS of ice. DO NOT let it get warm or you’ll be remembered as the grinch who food-poisoned the family. Combine the broth, salt, sugar, peppercorns, allspice, and ginger in a large stockpot and bring to a boil over medium-high heat. Stir until the salt and sugar dissolve. Remove from the heat. Cool to room temperature and refrigerate the brine. I usually like to add a little herb bundle combination such as Rosemary, Thyme, and Spicy Oregano to the broth. You can also add some dry white wine to replace the sugar! Place a 14-16lb turkey in a brining bag or large plastic bag. Make sure the entire thawed bird is immersed in liquid and brine for 24 hours. This liquid also makes for an AWESOME basting fluid as the bird cooks. You can rinse the bird and then cook any way you wish – bag it, baste it, or grill it. Add more wine as needed to keep volume of basting liquid up. Super flavorful and very easy! Turkey tends to get all the spotlight on Thanksgiving, but let’s be honest, your dinner is nothing without some stellar sides. Here are a few of our time-tested favorites from stuffing to veggies (yes you can eat them on holidays!) and beyond. This recipe is so savory and sweet at the same time, it makes my mouth water just thinking about it! I get this recipe straight from Fine Cooking Magazine’s killer Spicy Thanksgiving Feast Menu. I typically make the cornbread from scratch and leave it out to dry up overnight for that very perfect consistency to create moist, yet not MUSHY stuffing. I am a big fan of this recipe, so I typically double the batch in order to have some cook outside the turkey as well. Up to 3 days before: Prep cornbread and leave out overnight to dry out. Crumble up. Store until ready. In a large skillet, cook the sausage over medium heat until browned. Remove with a slotted spoon and set aside. Add enough rendered bacon fat or butter to the pan to get about 5 Tbs. total fat. Add the onion, celery, peppers, garlic, thyme, red pepper flakes, and salt. Cook briefly until the onion is softened. I will pour about 1/4 cup of white wine in the pan here and scrape up any browned bits in the pan. Combine in a large bowl with the crumbled cornbread, scallions, parsley, chives, and pepper. Toss to combine. If baking some or all of the stuffing in a casserole, pour a cup or two of stock over the stuffing to replace the juices the stuffing would have absorbed from the bird. If you want to be “extra” pick up some turkey wings in addition to your bird and place over the top to drip juices into it. Bake it covered until heated through, 45 minutes to 1 hour. For a crunchy top, uncover it for the last 15 minutes of baking. I usually add some pads of butter here as well, for some extra flavor as the top is roasting. Feel like you need some greens to balance out all that turkey and stuffing? Us too, us too. But let’s be real, with all the activity in the kitchen, we like to keep our veggies easy-peasy on Thanksgiving Day. Luckily, harnessing the delicious, nutty flavor of Brussels sprouts requires very little effort. Even better, if you prep and slice the sprouts ahead of time, this dish can be in and out of the oven in 35-45 minutes, which also happens to be the perfect amount of time for your turkey to rest before serving. Boom-shakalaka. Preheat oven to 400 degrees. Trim and halve Brussels sprouts, pulling off any loose or browning leaves. Prepare a sheet pan with oil of your choice and spread Brussel Sprouts evenly in a single layer. Toss with remaining oil and sprinkle with salt and pepper. Roast for 35-45 minutes until outer leaves are crispy and golden to medium brown. Salt and pepper to taste. Serve hot! These are a bit labor intensive so usually one I bring if I’m not the host. They transport well and are impressive and reliably delicious! You’ll end up with a whole bunch of orange innards that you can utilize to make a fantastic light pre-dinner cocktail or mimosas for morning after. Makes 8 servings, modified from recipe by Emeril Lagasse. Preheat the oven to 400°F. Place the potatoes on a baking sheet and bake until tender, about 1 hour. Remove from the oven and let rest until just cool enough to handle. Reduce the oven temperature to 350°F. Make the orange cups by cutting the oranges in half around equator and scooping out the pulp, leaving only the shell. Set aside. Peel the potatoes and put into a large bowl. Discard the skins and any tough, stringy fibers. Add the butter, and with an electric mixer, beat out the lumps. Add the 1/4 C sugar, eggs, orange juice, heavy cream, and brandy, and mix until smooth. Add the cinnamon, nutmeg, and salt, and mix well. Re-season with salt, more sugar or more spice to taste. Spoon the sweet potato mixture into the orange cups, mounding and smoothing the top. Bake until puffed and slightly golden, about 20 minutes. For an indulgent, fun “traditional” spin, top with mini-marshmallows and broil or torch to brown. To me, Thanksgiving means homemade pie. I mean, after all the gratitude, etc… of course. I could happily do the whole holiday without a turkey, mashed potatoes or cranberry sauce altogether. Know that if you come to my house with a store-bought pie on this special day, you will be turned away at the door. jk. I’m not that crazy. I will throw that sh*t straight in the trash when you’re not looking though. Having grown up in a home with amazing cooks who didn’t really do any baking, I went through a LOT of trial and error learning to make pie, and specifically pie crust. SO easy to mess up and end up with a gooey or dry crumbly mess. SO hard to get reliable, flaky, pretty results. It wasn’t until America’s Test Kitchen went and got super nerdy on the process that I found a perfect recipe that is ultra-easy AND reliable. It is not healthy, like, at all. If that’s your goal, skip pie. Here it is. Works with any filling you desire. Go forth and be thankful. Adapted from America’s Test Kitchen. Open lid, sprinkle butter and shortening around the top. Close, process ~ 10 seconds until it resembles cottage cheese. Open up, scrape down sides. Add remaining 1/2 C flour and pulse until evenly distributed and dough is broken up. Usually 4-6 pulses. Empty into a cool dry bowl. Sprinkle water + vodka over the top and fold in with rubber spatula until dough is tacky and sticks together. Flatten into 4″ disc onto piece of saran wrap or wax paper and refrigerate AT LEAST 45 minutes. This dessert is 100% easy and 100% delicious. It’s my go-to and is always a hit! 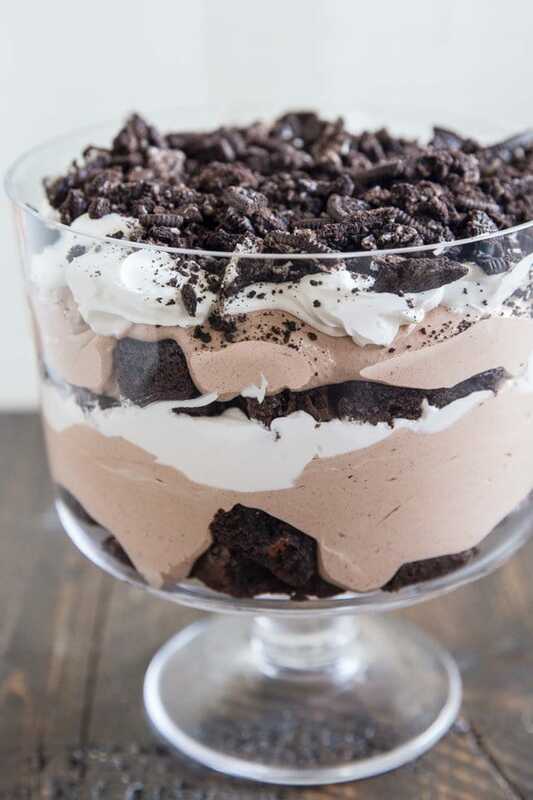 Layer as follows: 1/2 crushed Oreos, 1/2 pudding, 1/2 whipped cream, 1/2 pudding, 1/2 whipped cream, 1/2 Oreos into trifle bowl or whatever you got that’s glass to show off the layers. For the rest of the orange juice from above or fresh squeezed orange juice from whatever else… adapted from this recipe by the awesome Gabriella. Vanilla-Cardamom Simple syrup: bring 3/4 C granulated sugar, 1 C water, large pinch ground cardamom or a few cracked cardamom pods and a split vanilla bean just to a boil then take off heat until cool. Cocktail: Shake 1 part cooled syrup + 2 parts fresh orange juice with ice. Pour into champagne glass, top with 2 parts dry sparking wine such as Brut or Blanc de Noirs. Garnish with orange slice if desired. I may not be known for my cooking, but my company and my ability to bring beverages is unparalleled! Enjoy food, drink, and conversation with wonderful people. Ignore the rest. Christiana, Kristy, Annie, and Margo – who are all grateful for YOU!